Processing, screening and crushing existing concrete and asphalt on-site eliminates unnecessary transportation costs and hassles. The recycled product may be used on the current project at hand, sold to another job or transported and stored for future work – saving space in landfills and saving money for the client. 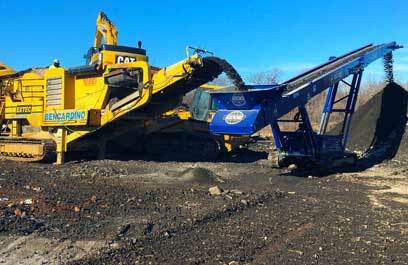 Considerable savings can be realized with on site crushing and screening services offered by Bencardino Excavating. Surplus, or unsuitable materials can be processed into valuable aggregate products. 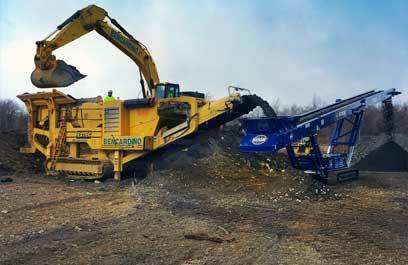 Crushing and recycling on the job site eliminates unnecessary transportation costs. Aggregate products produced may then be used on site, transported to another location, or sold. 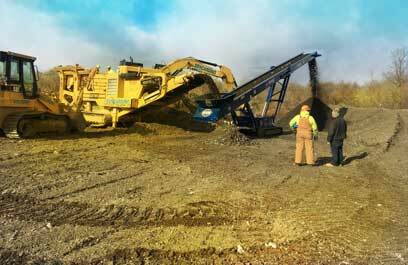 Bencardino's experienced crews operate crushing and screening equipment throughout Pennsylvania, and New Jersey. Road builders, housing developers, and commercial site work contractors all can realize significant savings with Bencardino's on site crushing services. When we had rains and floods, the guys from Bencardino were out there every hour I needed them, pumping basements, shoveling snow... Anything I needed them to do, they did. They kept me in business for awhile. Steve Eberling, Project Manager, Bovis Lend Lease, Inc.